My kids like to play with the old, real phones in the housekeeping area and also at our writing table (‘the office’, as they call it). The problem is that they holler at each other from across the room when they ‘talk’ and I just can’t afford to lose any more tooth enamel from the grinding. 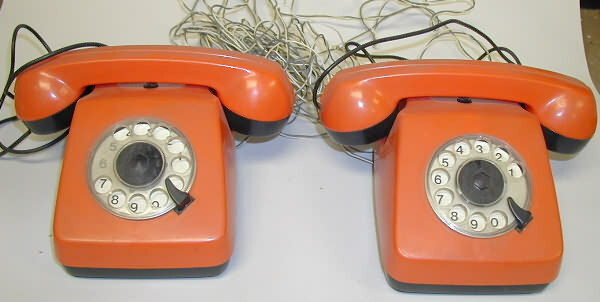 I started thinking about the toy wired telephones from my youth that were both magical and horribly dissappointing. 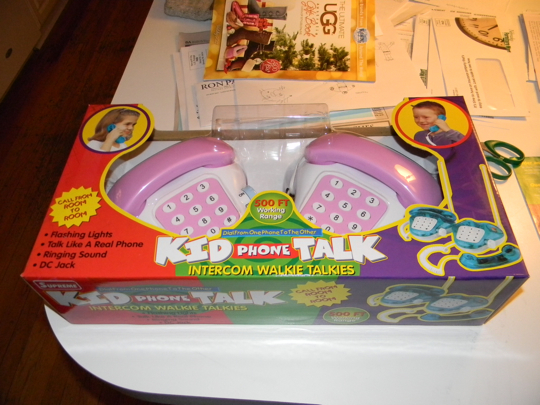 Then I wondered, ‘Surely in this day and age of cell phones somebody has invented toy phones that are wireless.’ Sure enough, one obscure company has! So, I ordered a set. I justified myself by saying that they would help the children learn proper telephone manners and also help the shy kids learn to speak up, but really – I just wanted to play with them. Guess when they arrived? When Lloyd was in Missouri visiting his parents. I was so excited to try them out!!!! With….. no one…..
“Did you hear the one about the unstamped letter? You wouldn’t get it.” Ha! I too hate to talk on the phone. I’m not at all disappointed that no one wants to spend the money to call me here. I’m picture little boys, crossing their eyes, trying to look at their tongues. Well, of course, they’re sticking out their tongues, too, but not at you. Tim’s favorite color is pink. He says it’s blue, but I think that’s just his cover becasue he has an older sister who makes fun of him for liking pink. When choosing things that come in a variety of colors, the boy picks the pink one. Every time. That makes me feel better. Luke loves him some pink. Excellent! Way to get what you want! You know I have been wanting an Easy Bake Oven for years now. I had one as a kid & I loved it! I do so desire to make cute little desserts again … using the cute little pans … and having a single serving sized cake. I don’t have the creativity of you Lauren to come up with pies in a jar, etc. so this is the next best thing. What excuse reason could I use for having this in my house. Is it too soon for Crazy Old Lady?